This week, I am reintroducing a piece that I did for years for clients of my investment advisory. I am moving it to Seeking Alpha, so a wider audience can tell me that I'm wrong about things. Each quarter, I will brush over my general outlook for the economy, corporate health, and markets. It is a summary piece, so one cup of coffee should do. I will touch back on some of these topics in more detailed pieces later. In my recent free Friday webinar, I spend several minutes covering the underlying weakness in the economy, which is a widening bifurcation between haves and have-nots. That is serious problem, but not one that will be solved quickly, nor one that is ready to tilt the economy into recession. Second quarter GDP was unrevised and remained at 4.2%. A combination of factors are contributing to the strong GDP. The years of stimulus by the Federal Reserve is being used by the economy finally. After years of the perception of a not-business-friendly administration, President Trump has clearly unleashed some animal spirits. The tax cuts are certainly having an impact as consumer spending is strong, and corporations are doing well (more on that below). The tax cuts will only have a temporary impact, however, and we will need to monitor that in the next year or two. Potentially, the most important thing for the strong economy has been the emergence of the U.S. energy sector. I discussed this way back in 2012 when I predicted GDP prints in the 4% range in the latter part of this decade. That forecast is now coming true. In the big picture, the economy is strong as unemployment runs low, and inflation is near the target 2% rate. Credit is slowly tightening as the Fed raises interest rates and shrinks its balance sheet, but the impact isn't likely to be felt this quarter. On several occasions, I have discussed the Federal Reserve's approach under Chairman Powell. What has me concerned is that I believe the Fed is making 2 huge mistakes. As I have repeated in my "slow growth forever" articles, deflation, not inflation, is the real boogeyman. Chair Powell must be careful not to overestimate inflation due to past monetary stimulus as demographic headwinds will continue to blow and blow harder in the coming decade. In a recent interview, Stanley Druckenmiller, a former manager of the Soros Quantum Fund and Chairman of Duquesne Capital, who now manages his own ten-figure net worth, points out that the tightening of credit is likely to lead to a financial crisis at some point. I agree it could, but am not necessarily sure it will, and certainly not imminently. "The median forecast for growth in inflation-adjusted gross domestic product (real GDP) from the fourth quarter (Q4) of 2017 to the fourth quarter of 2018 is 3.1%, a 0.3-percentage-point increase from the June 2018 NABE Outlook survey. The median forecast for real GDP growth from Q4 2018 to Q4 2019 calls for a moderation to 2.5%—unchanged from the previous survey. The panel anticipates economic growth in 2018 will be stronger than the actual 2.2% annual real GDP growth rate in 2017. On an annual basis, real GDP growth in 2018 is expected to be 2.9%, a slight rise from the 2.8% in the June survey, while the forecast for average annual real GDP growth in 2019 of 2.7% remains unchanged." The economists' main concerns centered around trade issues as 41% named that as their primary risk factor. The group does not see a recession this year or next as 56% felt it was unlikely. I have suggested the possibility of a "skip-straight" recession starting in Q1 of 2019. That is, a flat to down quarter followed by an up quarter, followed by a down quarter. I might be a bit early on this, but a jagged economy, in this "on time" inventory world, makes more sense to me than a protracted downturn. 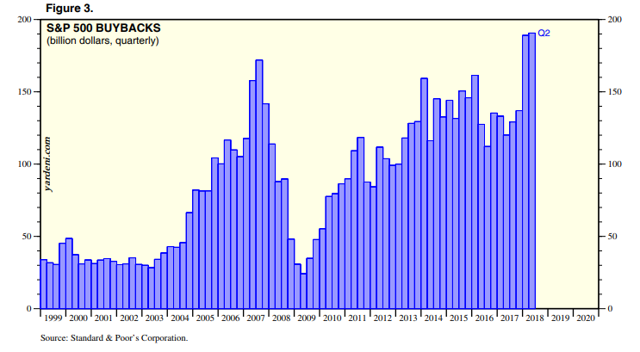 In my heavily read and criticized "The Buyback Bubble Will End Badly"article, I discuss that once the corporate buybacks slowdown, likely in 2019, and the economy moderates a bit due to less monetary liquidity, then the "slow growth forever" world takes over again. When that happens, it is not really a matter of "if," we will likely see a substantial stock market correction and possibly the first cyclical bear market in a long time. In the short term, however, the stock market looks poised for a strong fourth quarter coming out of earnings. Through last week, 98 out of 500 companies had issued earnings guidance for the 4th quarter. 74 gave negative guidance. That is 76% which is slightly higher than the usual 71% that give negative guidance. The trade noise (for now, it's noise) and a slowdown in buybacks during earnings could lead to some October choppiness. I think that is volatility to be bought for a swing trade at least. Clients and subscribers will be selling a bevy of cash-secured puts expiring in December and January. 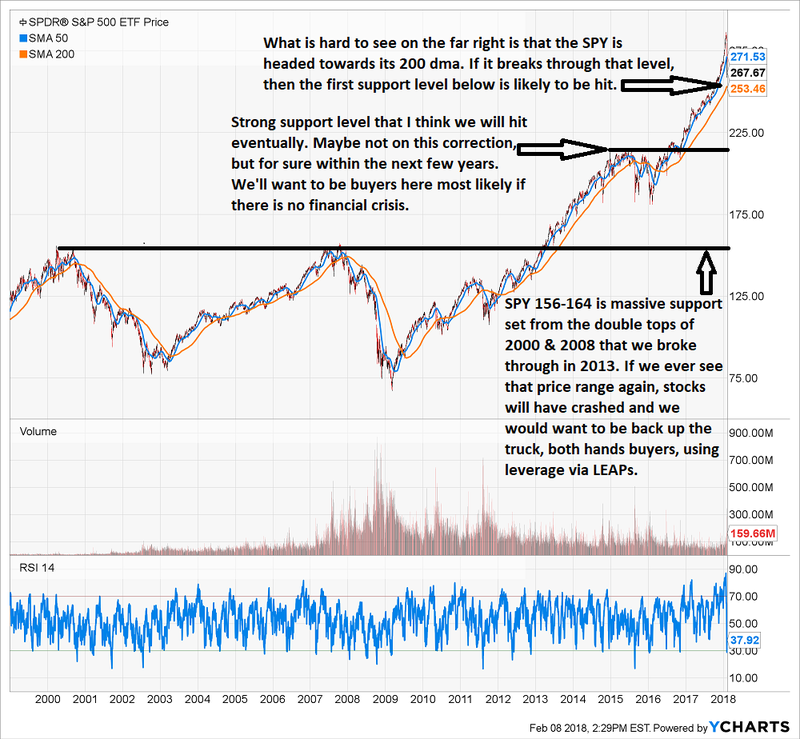 If the rally I see ending the year occurs, then we might finally see the "euphoric" peak of this stock bull market soon. People chase performance, that is all there is to that. It's not a wise strategy, but a majority of people employ that approach. 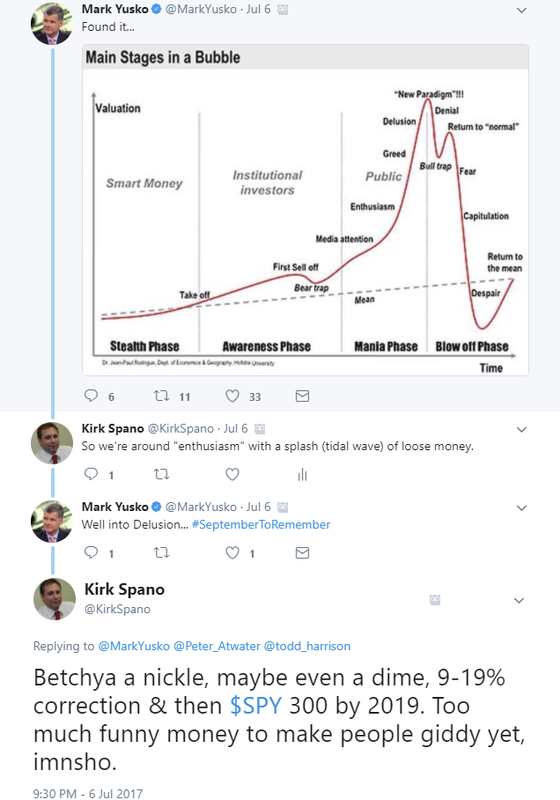 In the conversation below, which took place July 6, 2017, I told Mark Yusko that I did not believe the markets were "delusional" or euphoric yet. I bet a shiny nickel that the S&P 500 would run to 3000 plus by 2019 before the next bear market. We are of course right on top of 3,000 now. "The S&P 500 could run to 3000 by year-end or early next year on the last Goldilocks rally." Funny things happen when people catch a case of "FOMO" (fear of missing out) though. They will chase, chase, chase, and rationalize every click of the mouse and addition of risk. If this rally occurs, and you are watching it around the holidays, rather than giving into a case of FOMO, you should really pick up a case of FOGYAK (fear of getting your assets kicked - that has been modified for family audiences). The rally later in December and into January will be a rally to sell into most likely - if it occurs. Once again, here are some of the most stolen charts on the internet from the excellent Doug Short and Jill Mislinski. I will only show one, but you can click the link in the last paragraph to see more. 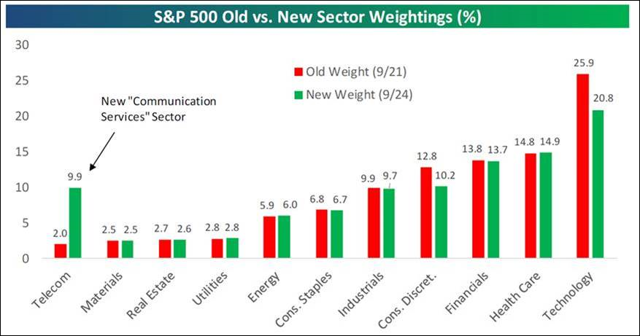 What that chart means is that stocks are historically expensive. The second most expensive in fact. Stocks are approaching a 3rd standard deviation event, and that's only happened one other time, during the tech wreck when NASDAQ lost nearly 90%. 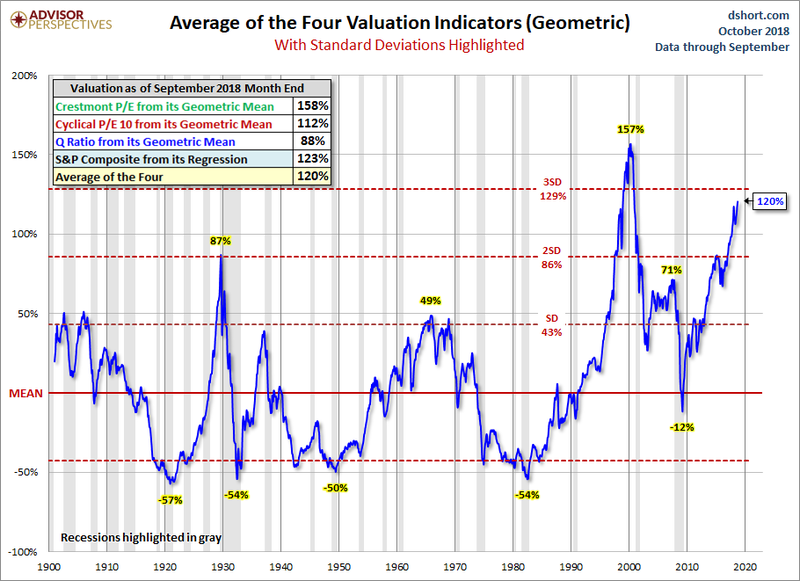 Valuations weren't this high prior to the financial crisis. Here's the kicker, though. 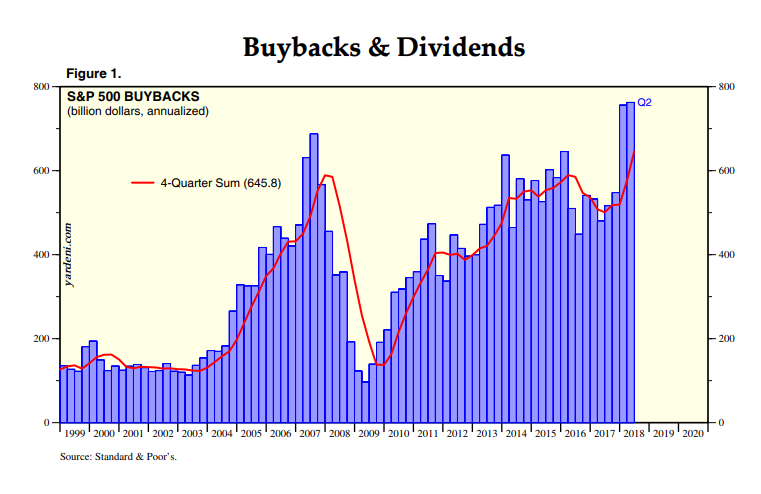 Once the buybacks fall off, which is virtually guaranteed as there's only so much money to be repatriated, the earnings picture will get materially worse in this "slow growth forever" world. Note: if you don't understand or accept "slow growth forever" please don't just trust me, read Minneapolis Fed President Neel Kashkari (a Republican) or former Treasury Secretary Larry Summers (a Democrat). There are plenty of others as well. Of course, "things could be different" this time, but those are pretty dangerous words. While I am pretty bullish on the rest of this year, I am likely to become very cautious again next year. As I have covered repeatedly, oil is a primary concern for the economy. The black goo isn't quite as important as it was before the financial crisis, now that tech has proliferated everything, but it runs near the top of "most important" global economic factors. I discussed the "Goldilocks" price for oil soon after I reiterated my call that oil would in fact rise to $80 per barrel. 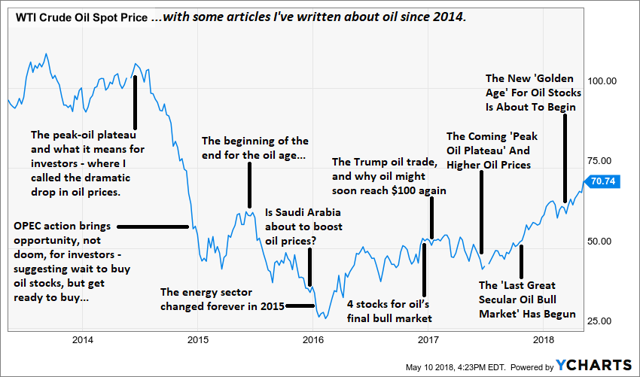 I suspect that Saudi Arabia will be able to keep oil prices from rising much more. 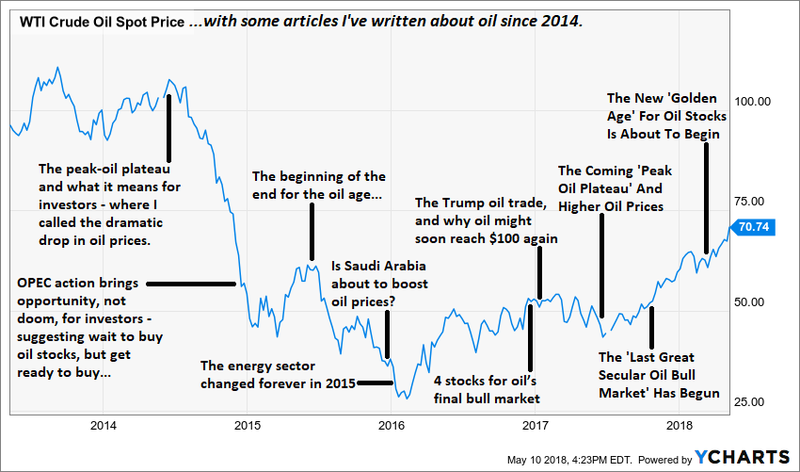 I do find it laughable though that President Trump is blaming OPEC for the current oil price. Oil has risen because of two things lately. First, U.S. production is flattening out due to bottlenecks because of a lack of pipelines in Texas. Second, the U.S. sanctions on Iran have taken a million barrels of supply out of the international oil equation. That's a pretty big deal. That all said, oil, as it rises, puts a dent into American consumers in particular as we are so car dependent. Depending on the study, we can see that gasoline that approaches $4 per gallon starts to impede consumer spending. Here is something anecdotal. As many of you know, I did a 3,700-mile road trip around the midwest and east coast this August. I've never had a harder time finding hotels on short notice (which I do, because I don't know exactly where I'll be day to day throughout these annual jaunts). Venues and attractions were busy almost everywhere. I chalk this up to a stronger and confident consumer, as well as, low gasoline prices. Now that we are past summer drive season, I don't see a large hit to consumer spending soon, but if gasoline prices are higher come spring, then next year's summer drive season could be subdued and along with it, consumer spending. Skip-straight recession anybody? 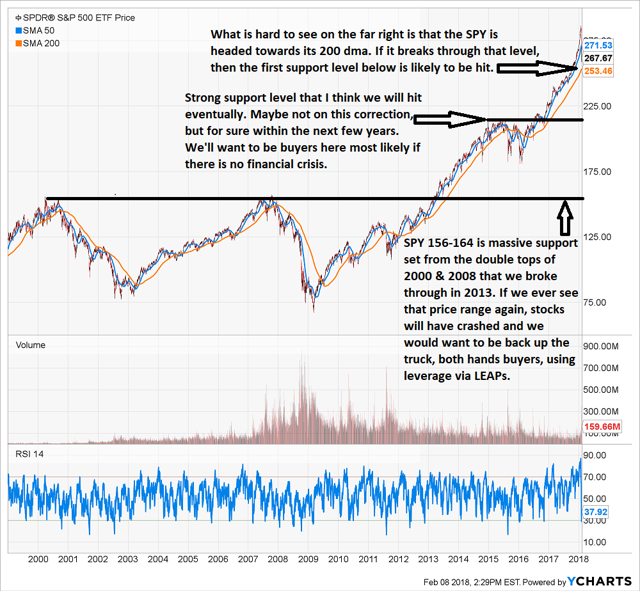 This chart is provided by Raymond James' Jeffrey Saut. 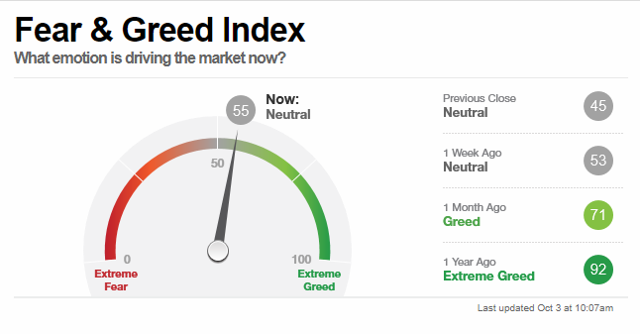 Crestmont Research believes we still have a final shoe to drop in the bear market that started in 2000 that went through the financial crisis. 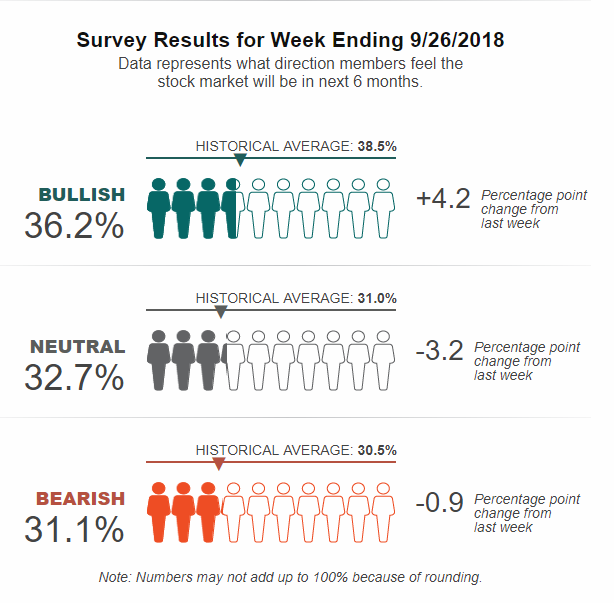 They believe this is a cyclical bull market within a secular bear market. I'm not so sure anymore. Here's what I know, the next crash could be bad or really bad. Unlike some analysts, I doubt we ever see a bear market that takes us anywhere where near the lows of 2009. Why? Simply put, there's a lot more money now in the world to buy assets. And, we know now that central banks will print money, or at least borrow again via QE, if really needed to avoid a depression. Again, I don't think a crash is imminent, but a correction of 5-10% might be. See the Yusko graphic above. I predicted a 9% to 19% correction for earlier this year. It happened. Right now, I am holding about 25% cash in portfolios because as I've discussed risk is high. Valuations and buybacks are conspiring against us at some point. But, for now, the trend is our friend. We'll see how long that lasts. My holding cash has led to very good returns since I decided to take on new clients a while back. Many believe that being fully invested is important to returns. I differ, I believe building cash with dividends, option sells and occasional stock or ETF trims (and outright sells) is important in obtaining "optionality." Optionality is essentially the ability to strike when the iron is hot. For investors, you can't "buy low" if you have no cash. There is something that is good and cheap in the markets on a regular basis, so building up cash, whether through savings or investment management should be part of any investors process. So, here's my prediction. I am a likely put seller and stock buyer in October with the cash we hold. However, if the market doesn't come back to us a bit, then we won't be, and we'll ride along with the energy, telecom and tech heavy portfolio we currently have until a better opportunity presents to get more fully invested.